Last year, Hooded Fang's D. Alex Meeks released an album with his Holiday Rambler side-project. Now, he's revisiting that project for a new split tape with Chik White (aka Divorce Records founder Darcy Spidle). While Holiday Rambler's 2012 album was called There Is No End to the World, and Nothing Can Shatter the Earth, this latest collection bears a similarly lengthy title: It Lasted a Hundred Years, It Will Last a Hundred More. Holiday Rambler's half of the tape features field recordings from the American South. An announcement describes it as "a view through the trees into the fabled origins of Holiday Rambler, a prequel to the story that began on debut LP There Is No End to the World, and Nothing Can Shatter the Earth." Watch a trailer video for release below. The split tape is available in a limited edition of 50 via Arachnidiscs Recordings. 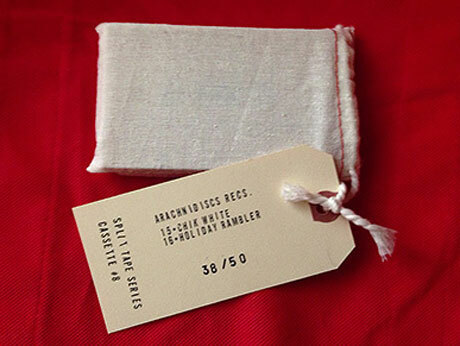 It's uniquely packaged in a cloth bag with a hand-stamped tag and comes with a download code. It's available to order now via the label. Holiday Rambler will officially launch the tape with a show on April 25 at the White House in Toronto. It Lasted a Hundred Years, It Will Last a Hundred More from Quality Co. on Vimeo.